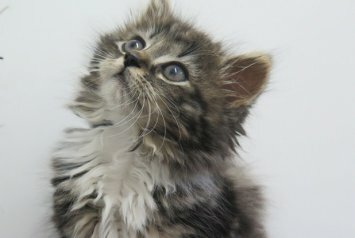 A kitten born with a rare chest deformity now needs an urgent operation to save her life. Precious the kitten was born at the Margaret Green Animal Rescue in Tavistock, and the management is appealing for help to fund her life-saving operation. Precious was born in September after her mother Poppy was handed into the rescue centre. At three weeks of age, staff noticed a difference between Precious and her siblings. Precious’ breathing was rapid and she did not have the stamina that her two sisters had. Precious was diagnosed with Pectus excavatum, a deformity which is a congenital defect.